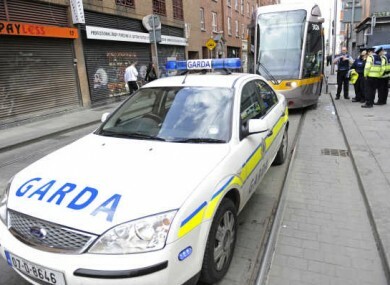 File photo of Gardaí attending an incident on a Luas line. A CAMERA IS to be installed in Dublin City Centre to catch drivers who run red lights. The proposed scheme will see the Gardaí issue fines to alleged offenders, Dublin City Council confirmed today. Sergeant Jim Molloy told TheJournal.ie that this is the first red light camera enforcement project in Ireland. However, those who have been caught making an infringement will only be subject to prosecution if they do not pay the fixed charge. “In accordance with the standard practice in respect of fixed charge notices, prosecutions would be initiated if payment of the fixed charge wasn’t received,” he said. Drivers can be fined up to €120 for running red lights and penalty points can also be issued. The Garda Press Office was not able to confirm the start date for the trial but said images from the camera will be used to issue fines. The AA has no problem with the idea in principle, and in fact it is particularly important along the Luas Red line between O’Connell Street and Smithfield where there have been a number of collisions between cars and Luas trams. We will watch the red light experiment closely and see what feedback we get from AA Members but we feel that most drivers will feel that it is a good idea. According to the Irish Independent, the camera will move between the junctions where the Luas red line meets Blackhall Place and Queen Street on the quays. Email “Camera installed in Dublin to catch drivers running red lights”. Feedback on “Camera installed in Dublin to catch drivers running red lights”.